15044 ESS SOMALI COAST (1958) Warthog*. Trial color proof strip of 3. Scott No 271, Yvert No 287. 4068 ESS SOMALI COAST (1959a) Parrotfish*. Trial color proofs in margin strip of 5 with multicolor. Scott No 275, Yvert No 294. 4069 ESS SOMALI COAST (1959b) Hammerhead shark*. Trial color proofs in strip of 5 with multicolor. Scott No 282, Yvert No 302. Beautiful! 4569 ESS SOMALI COAST (1959) Manta ray*. Trial color proofs in strip of 5 with multicolor. Scott No 279, Yvert No 296. Stunning! 10147 ESS SOMALI COAST (1959b) Henioque*. Trial color proofs in strip of 5 with multicolor. Scott No 276, Yvert No 294. 10148 ESS SOMALI COAST (1959c) Swordfish*. Trial color proofs in strip of 5 with multicolor. Scott No 277, Yvert No 293. 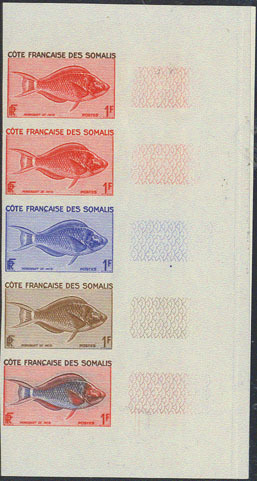 10149 ESS SOMALI COAST (1959d) Trunkfish*. Trial color proofs in strip of 5 with multicolor. Scott No 278, Yvert No 295. 10150 ESS SOMALI COAST (1959e) Ballista*. Trial color proofs in strip of 5 with multicolor. Scott No 280, Yvert No 299. 10151 ESS SOMALI COAST (1959f) Pseudoballista*. Trial color proofs in strip of 5 with multicolor. Scott No 281, Yvert No 300. 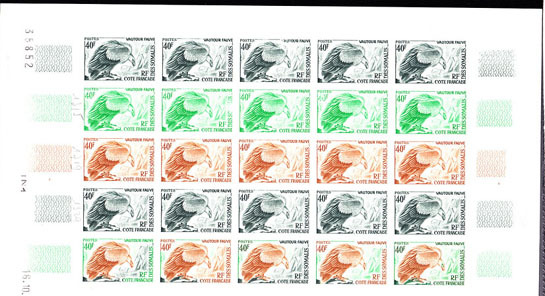 18479 ESS SOMALI COAST (1959) Parrotfish*. Trial color proofs in strip of 5 with multicolor. Scott No 275, Yvert No 292. 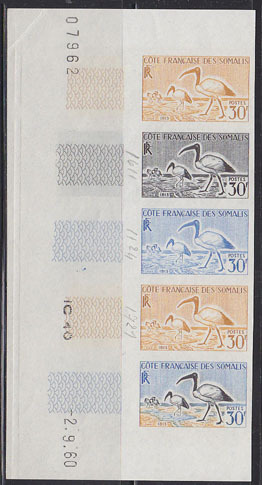 18480 ESS SOMALI COAST (1959) Henioque*. Trial color proofs in strip of 5 with multicolor. Scott No 276, Yvert No 293. 18481 ESS SOMALI COAST (1959) Swordfish*. Trial color proofs in strip of 5 with multicolor. Scott No 277, Yvert No 294. 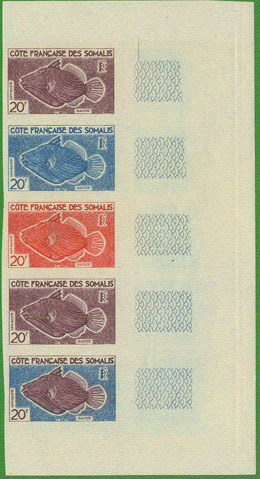 18482 ESS SOMALI COAST (1959) Trunkfish*. Trial color proofs in strip of 5 with multicolor. Scott No 278, Yvert No 295. 18483 ESS SOMALI COAST (1959) Ballista*. Trial color proofs in strip of 5 with multicolor. Scott No 280, Yvert No 299. 18484 ESS SOMALI COAST (1959) Pseudoballista*. Trial color proofs in strip of 5 with multicolor. Scott No 281, Yvert No 300. 18485 ESS SOMALI COAST (1959) Hammerhead shark*. Trial color proofs in strip of 5 with multicolor. Scott No 282, Yvert No 302. 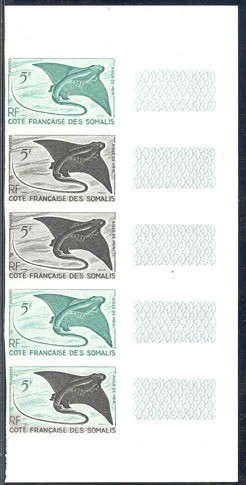 18622 ESS SOMALI COAST (1959) Manta*. Trial color proofs in strip of 5 with multicolor. Scott No 279, Yvert No 296. 6616 ESS SOMALI COAST (1960) Sacred Ibis*. Trial color proofs in margin strip of 5 with multicolor. Scott No 285, Yvert No 301. Gorgeous! 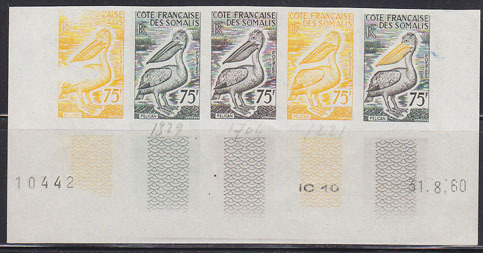 6619 ESS SOMALI COAST (1960) Pink-backed pelican*. Trial color proofs in margin strip of 5 with multicolor. Scott No 286, Yvert No 303. Marvelous! 6621 ESS SOMALI COAST (1960) Bustard*. Trial color proof pair. Scott No C23, Yvert No PA28. 6622 ESS SOMALI COAST (1960) Bustard*. Trial color proof. Scott No C23, Yvert No PA28. 16644 ESS SOMALI COAST (1960) Administrator Bernard*. Soldiers*. Flag*. Trial color proofs in strip of 5 with multicolor. Scott No C22, Yvert No PA27. 3160 ESS SOMALI COAST (1962) Cony*. Trial color proofs in strip of 5 with multicolor. Scott No 288, Yvert No 306. 15748 ESS SOMALI COAST (1962) Griffin vulture*. Trial color proofs in full sheet of 25. Scott No 291, Yvert No 309. 18488 ESS SOMALI COAST (1962) Large flatfish*. Trial color proofs in strip of 5 with multicolor. Scott No 289, Yvert No 307. 4943 ESS SOMALI COAST (1966) Stapelia*. Trial color proofs in strip of 5 with multicolor. Scott No C41, Yvert No PA47. Attractive! 18517 ESS SOMALI COAST (1966a) Senna*. Trial color proofs in strip of 5 with multicolor. Scott No 306, Yvert No 325. 18518 ESS SOMALI COAST (1966b) Poinciana*. Trial color proofs in strip of 5 with multicolor. Scott No 307, Yvert No 326. 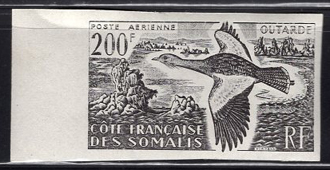 18519 ESS SOMALI COAST (1966c) Aloe*. Trial color proofs in strip of 5 with multicolor. Scott No 308, Yvert No 327.